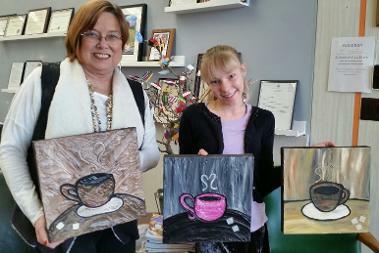 My Coffee Cup Artwork is on display and for sale at the amazing EGG Gallery and Business Incubator! Join us over coffee and donuts for a monthly 'Meet & Greet' every second Tuesday each month. We want to find out what YOU are interested in and share what we do at the NEKC Chamber of Commerce, the Independence Avenue CID and our EGG POP-UP Business Incubator & Gallery.